The interest rate cycle is closely related to the economic or trade cycle. In theory, movements in interest rates should mirror the economic cycle. If the economy is growing strongly and inflationary pressures increasing – Central Banks will increase interest rates to slow down the economy and prevent inflation. If the economy enters into recession with falling inflation and rising unemployment – Central Banks will cut interest rates to provide an economic stimulus to try and increase the rate of economic growth. 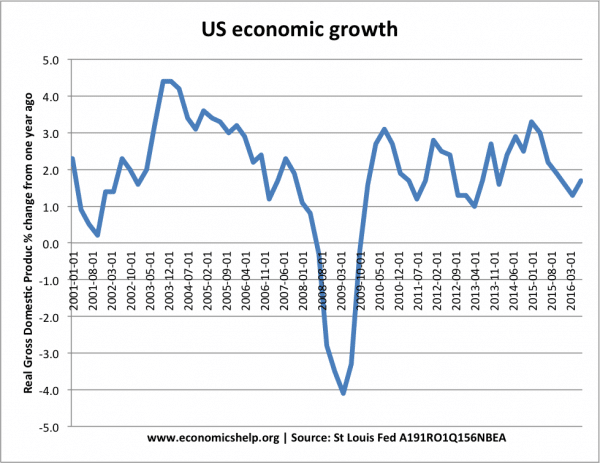 In 2001, there was a concern the economy was slowing down following the 9/11 terrorist attacks. The Federal Reserve cut interest rates to strengthen domestic demand. In 2006, this increase in interest rates hit homeowners who had taken out large mortgages in the ‘boom years’ Mortgage defaults precipitated a credit crunch and fall in investment and spending. 2016 onwards. However, the Federal Reserve has started to increase interest rates as the US economy returns close to a more ‘normal situation. Unemployment has fallen and the economy has been consistently expanding since 2009. If the recovery continues, interest rates are likely to continue rising. Interest rates cut to 0% in 2009. If the economy is growing too quickly then we start to get a positive output gap (sometimes referred to as ‘overheating’. 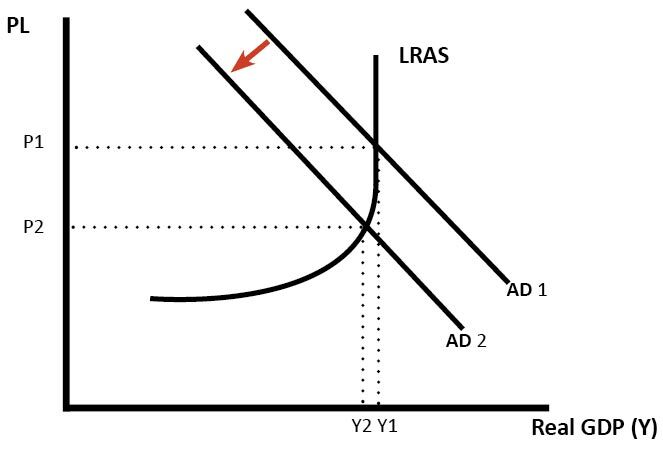 It is a situation where aggregate demand (AD) is growing faster than productive capacity (LRAS). Therefore, firms start to put up prices – causing inflation. Inflation is considered undesirable because it creates uncertainty and the inflationary growth is likely to be unsustainable. Increase the cost of borrowing – discouraging investment and spending on credit. Tends to cause an appreciation in the exchange rate – more hot money flows. For example, if the US raises interest rates relative to elsewhere, savers will put money in US banks and US bonds because they give a relatively better rate of return. An appreciation in exchange rate tends to reduce inflationary pressure. Effect of higher interest rates – if the economy is close to full capacity. For example, if interest rates rise too rapidly then mortgage holders may be unable to afford mortgage repayments – this can lead to default home repossession and a big negative impact on consumer spending. 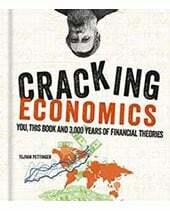 Between 1992 and 2007 Central Banks appeared to keep inflation low – enabling a long period of economic expansion. However, low inflation masked a credit bubble. Also, the US probably made a mistake of keeping interest rates very low in 2003 – when the economy was growing very quickly. The ultra-low interest rates of 2003/04 encouraged homeowners to take out big mortgages (often on poor credit history). This contributed to housing and mortgage lending bubble. In 1979, the government increased interest rates to 17% to reduce inflation. Inflation fell – but it caused the recession of 1980/81. Interest rates fell in the early 1980s and then in the late 1980s. 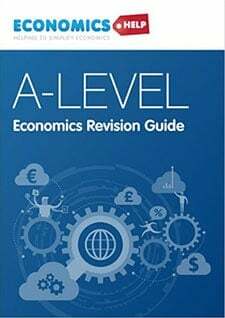 However, in the late 1980s, there was rapid growth Lawson Boom causing inflation of the late 1980s (This caused interest rates to rise to 15% (UK also joined the ERM). The very high-interest rates contributed to the recession of 1991/92. In 1992, the UK left the ERM and interest rates fell. During the great moderation 1992-2007, interest rates were unusually stable – reflecting the apparent stability of the economy. 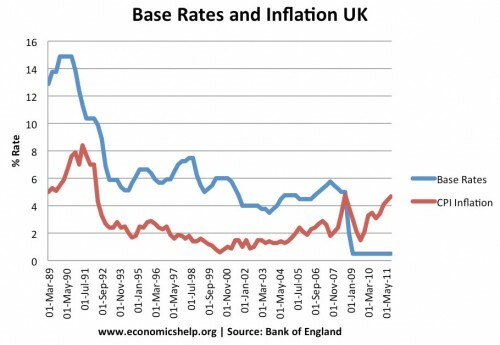 Like the US, the UK cut rates in 2009 – and have kept very low. When the UK left the ERM in 1992, the Government were able to cut interest rates; this was necessary because the economy was in a recession. Interest rates fell to 5% in 1995. Since 1995, average interest rates have been much lower. 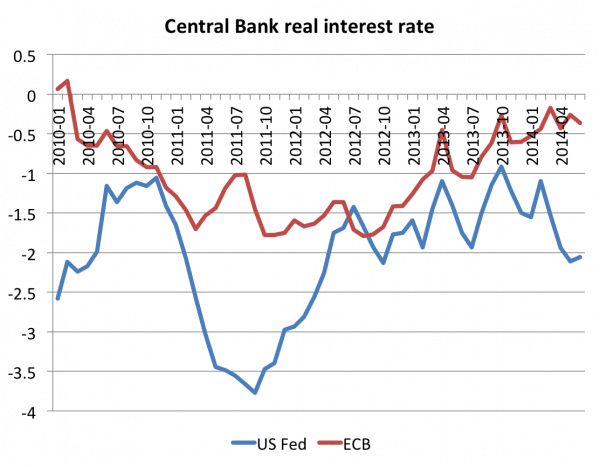 Another issue is the real interest rate (nominal interest rate – inflation). If inflation increases, higher interest rates mean that ‘real interest rates‘ remain positive. 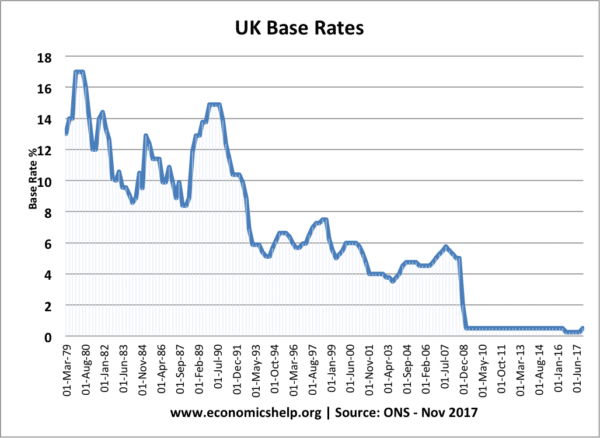 For example in the 1970s and early 1980s – interest rates were very high – but this partly reflected the higher rates of inflation. In 1997, the Bank of England was made independent and given the responsibility for setting interest rates. This prolonged period of zero interest rates (0.5% is often considered ‘virtually’ zero) suggests an end (at least temporary) to the interest rate cycle. This prolonged period of zero interest rates has led to negative real interest rates. This means savers are seeing a fall in the value of their savings. Prospects for economic growth in 2018 appear good. 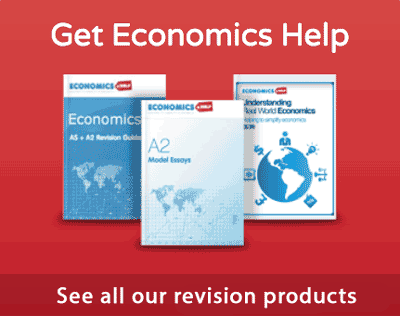 Economists have been revising growth rates upwards. The Eurozone in particular, has been exceeding past performance. The strong global growth is causing a rise in commodity prices, and for the first time in a decade, inflationary pressures may start to rise. Though wage pressure is still relatively muted – depsite low unemployment rates in UK and US. However, with US fiscal stimulus, economic growth may continue in 2018, and this could raise prospect of higher rates in UK and Eurozone. Monetary policy continues to be confounded by a general lack of inflation. Economic growth improved in most developed markets in 2017 but price pressures remain weak for reasons that aren’t clearly evident or understood. Even absent persistent price increases, central banks are correct in removing extraordinary stimulus (i.e. 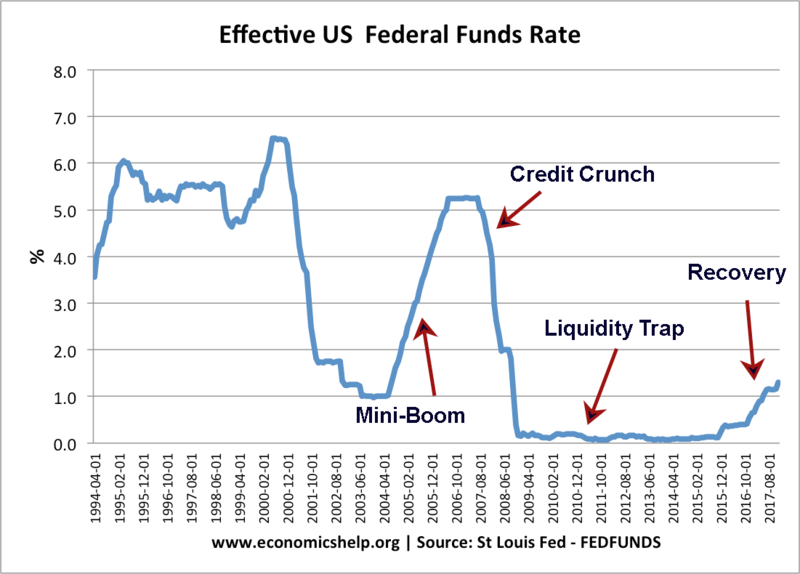 QE-style programs) and raising short-term interest rates modestly. 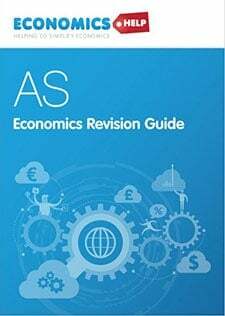 If nothing else, the evidence is fairly clear that these measures are no longer needed to spur economic growth, and it’s reasonable to expect that regular broad-based price pressures will emerge at some point. Most economic expansions have historically been crushed by tightening monetary policy. Consequently millions of Americans lose their jobs. 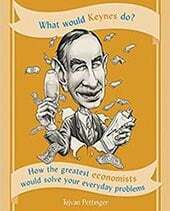 While it is true that the Federal Reserve is responsible for keeping inflation at, or near, sustainable levels one questions the wisdom of raising them so high, especially during low inflationary periods. Exactly how committed to maintaining economic growth and employment is the Federal Reserve?